Random Handprints - A NYC Mom Blog... live from New Jersey: Just go to sleep: Sleepy's Dr. Breus offers advice for when you just can't. Just go to sleep: Sleepy's Dr. Breus offers advice for when you just can't. This week is my kids first full week of school. And what always felt like an endless morning in the summer ("how is it only 7:45?!") now seems like it's going by in double time as I try to get everyone dressed, fed, watered and brushed. 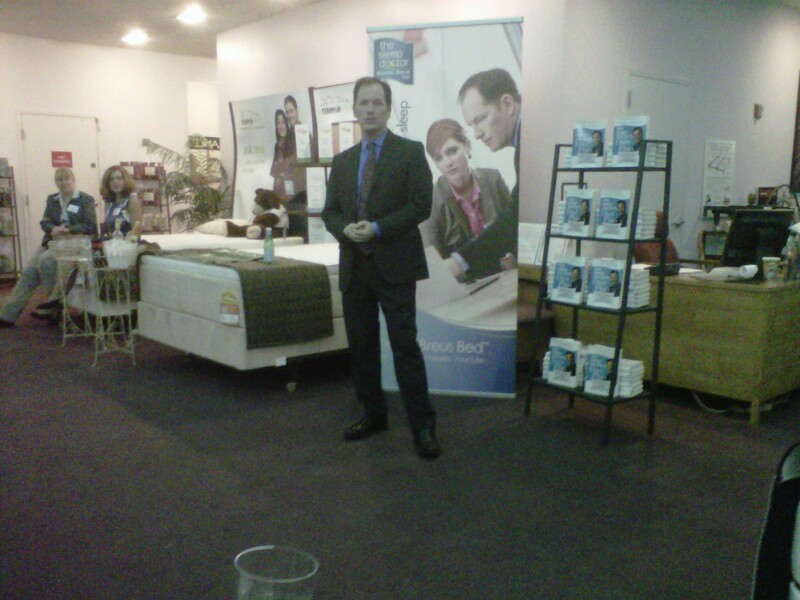 So I was eager to attend the event "Back-to-School/Back-to-Sleep" at Sleepy's Fifth Avenue store to hear what tips the Mattress Professionals had to share with us amateurs. Michael Breus, "The Sleep Doctor" and author of the book The Sleep Doctor's Diet Plan - Lose Weight Through Better Sleep shared a lot of great tips for kids, as well as their sleepy parents. Keep bedtime consistent. Try and have kids go to sleep at the same time every night, and wake-up at the same time every morning. Later bedtimes on weekends can lead to "Sunday night insomnia," for kids and adults. Have a bedtime routine that includes a "power down hour." About an hour before bed, put all electronics away. Especially your mobile phone. No one should be sleeping with their phone. Leave it in a different room. Teach kids to like sleep, and to be aware that a good night's sleep is an important part of staying healthy and being at your best during the day. Not to mention, well-rested kids tend to be less cranky. Exercising during the day and eating a healthy, nourishing meal about an hour before bed are two great ways to encourage better sleep at night. If you're an adult who has trouble sleeping, put the clock away. No good comes of staring at the clock and watching the minutes slip-by while you lie there, wide-awake. Drink highly-caffeinated drinks first-thing in the morning, followed by less-caffeinated drinks later in the day. If possible, avoid caffeine entirely after 2pm. Many thanks to Dr. Breus for the great suggestions, and to Sleepy's for a fabulous event. I received a gift bag and this post serves as my entry in a contest to win a Dr. Breus bed. My opinions are my own, as are the not one, but two, very comfortable (unmade) Sleepy's beds at my house. I need these. I have insomnia like a mofo these days. Hope you win the bed!! My husband has been falling asleep so quickly lately - he's been doing a lot of house projects in addition to work! I usually end up reading for a while in bed - but sometimes I am too tired for that! My son likes to do that too - flip through a book for a while and then sleep. My daughter *needs* to be read or sung to until she falls asleep. On days she doesn't nap it takes ten minutes, on days she does it takes half an hour to an hour.